Fundraiser event benefiting college scholarships for regional high school seniors seeks entries from local and regional barbecue teams. Barbecue samples are handed out during the Ark-La-Tex Ambassadors’ Grillin’ for Grads BBQ Cook-Off in Shreveport, Louisiana. We have awarded over $70,000 in scholarships to Ark-La-Tex high school seniors. The 7th Annual Ark-La-Tex Ambassadors’ Grillin’ for Grads BBQ Cook-Off will be held, Apr. 26-27, at Festival Plaza in downtown Shreveport. This fundraiser event benefits college scholarships for area high school students and includes live music on the Clyde Hargrove Memorial Stage, vendors, a kids’ play zone, mechanical bull rides, and lots of great barbecue. New in 2019, the festival will feature a craft beer garden for guests ages 21 and up. Team registration is now underway for this National BBQ Festival-sanctioned competition, which will award cash prizes in categories including chicken, pork ribs, pork, brisket, and the annual People’s Choice Award. For more information or to register a team to compete, visit http://www.arklatexambassadors.com. The Grillin’ for Grads BBQ Cook-Off will open to the public at 12 p.m. on Saturday, April 27, with People’s Choice Award sampling taking place until 3 p.m. During People’s Choice Award sampling, festivalgoers can sample barbecue prepared by teams that have elected to compete in the People’s Choice Award category. Awards will be presented at approximately 3:30 p.m. The annual Kids’ Cook-Off will also take place during the afternoon. 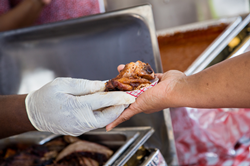 Admission to the 7th Annual Ark-La-Tex Ambassadors’ Grillin’ for Grads BBQ Cook-Off, which includes a People’s Choice Award voting token, is $10 for adults and free for children ages 12 and under. “The greatest aspect of this festival is that, to date, we have awarded over $70,000 in scholarships to Ark-La-Tex high school seniors,” said Madge Davis, executive director of Ark-La-Tex Ambassadors. For complete details of the festival, visit http://www.arklatexambassadors.com. For more information on planning a visit to Shreveport-Bossier, including information on local hotels, restaurants and attractions, visit http://www.Shreveport-Bossier.org or call (800) 551-8682.